Our Little Family: New Arrival! Did this picture make you think we adopted again? I wish. This is Bryson's newest cousin Zoey. She's the third child to my big brother Zack and his wife Heather. 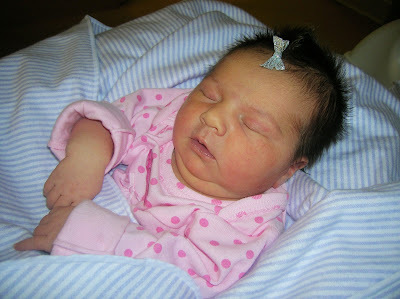 She was born on Monday morning and is so precious. I love her little double chin in this picture. 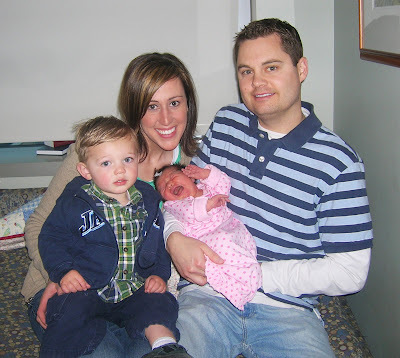 She was born just a few rooms down from where her cousin Mac was born, so being there again, waiting in the very same waiting room, brought back a lot of the same emotions we felt with Mac's birth. It was kind of a bittersweet experience. But we are so blessed to have her in our family and I'm sure Mac gave her a special hug to give to his mommy because she was the last one with him. 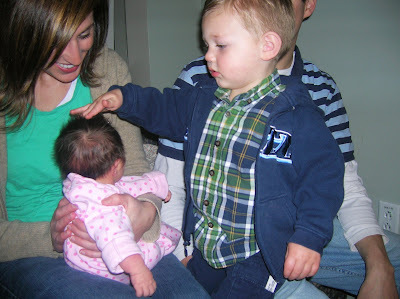 Bryson loved touching Zoey's head and just stared at her. He was so gentle with her and kept pointing to her and saying, "baby." He will make a fabulous big brother someday--hopefully soon!